Our highly sucessful Bread4PLA project received an Enviroment LIFE Programme LIFE Citizens Award. The project demonstrated that 175,000 tonnes of bakery waste can be made into biodegradable film in closed loop recycling. Since 1989, BC (or The BioComposites Centre) has been at the forefront of research, development and the commercial application of bio-based alternatives to synthetic materials in manufacturing and industry. Today, in a world where sustainability and the environment are moving to the top of the agenda, we offer businesses of all kinds the knowledge and the technical means to put those alternatives into practice, helping them lower costs, increase productivity and make their activities more environmentally and socially responsible. 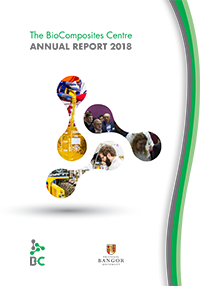 BEACON Conference 2017 "Developing a Sustainable Bioeconomy for Wales: A Future Roadmap"